It may not be Poltergeist or The Exorcist, but The Conjuring franchise certainly holds its own in the supernatural book of lasting genre entries. Storylines often get convoluted and require the viewer to rarely take in a fifth franchise entry without having some familiarity with what came before it. Here is where The Nun is able to speak out of the confession booth bravely and be its own stand-alone entry aside from serving its due process to filling in some story threads from the rest of the series. On the September 7th opening weekend, this writer along with 40 oz. contributor Curtis Sturrock, hit up a pretty much sold out show. Curtis had seen all the entries; advising that, if any, The Conjuring 2 would be the most important to get some knowledge of The Nun presence. However, that wouldn’t happen so seeing this film was a blank slate and would be judged primarily under that basis. CGI can destroy a movie if used incorrectly, or take an element of realism that leads to just an eye roll, but aside from practical FX, if you can do CGI, then go for it and that’s what Director Corin Hardy did from a story by James Wan and screenplay by Gary Dauberman. This can make or break a film and it is a relief to pass on the good word that it did help. After a brief glimpse of franchise star Vera Farmiga (“The Conjuring 1 & 2”, “Bates Motel”) explaining about seeing the Nun, the story then reverts back several years to Romania. A deeply gothic setting is presented here and it is fantastically creepy. Right away the viewer learns that an evil dwells inside this supposedly holy place, and two nuns find themselves at the mercy of this malevolent force with one having to make a sacrificial decision to protect the world from the evil. The Vatican learns of what has transpired and sends Father Burke (Demián Bichir, “The Hateful Eight”, “Machete Kills”) to investigate. He is joined by a young woman from the sisterhood named Sister Irene since she has a certain gift that will help in the investigation. Sister Irene is portrayed by Taissa Farmiga (“American Horror Story”, “The Final Girls”), the real-life younger sister of Vera, so instantly this film gets thumbs up in the casting department because the resemblance is spot on. It would be hard pressed for any casual viewer to not instantly clue in that this character grows to become Lorraine Warren of The Conjuring. Wait! She isn’t the same character? Clairvoyant abilities and all but not connected? Weird but seeing as this movie takes place in 1952, it would put quite the age question onto the woman so it is what it is. The audience is lead down the usual paths of mystery and revelation, yet also forced to endure what could be the only problematic nuance of a character in Frenchie, played by Jonas Bloquet (“Valerian and the City of a Thousand Planets”). Serving an important part to the greater franchise mythology, Frenchie is restricted mainly to the comic relief that is more distracting that gratifying. A clever plot thread tie-in later in the movie does justify the character’s inclusion so, for that, one can endure. While the ghostly Silent Hill-style nuns do some spooktacular justice during the climax, it is the Nun herself (Bonnie Aarons, “The Conjuring 2”, “Drag Me to Hell”) that captivates the screen with a demonic presence that you have to wonder how much acting was involved. She looked and felt horrifying! On the blood-splatter meter, this film goes for the suspense which is appreciated though there are several key moments with the red stuff. On a side note speaking of the red stuff, the main head-shaking came at only one element that could not be overlooked, and that is the fact that somehow this Romanian locale has secretly had an ancient artifact containing the blood of Jesus Christ. Morphing reality, ghostly apparitions greeting characters as they are buried alive, and gateway holes to hell are all fine and kudos to the imagination involved, but it seemed that this bit of holy salvation was a real stretch. Proven far too many times to count, the score is equally as important to the film as the story and characters, and Abel Korzeniowski does come through with a powerful score that lurks just underneath the skin to bring out those very best goosebumps. There’s a low organ-type “stinger” used many, MANY, times throughout which is very reminiscent of The Exorcist III but probably not an intentional throwback. It is not a perfect movie but does validate that franchise entries can be done without prior knowledge of what has come before, or after, it. There’s some clumsiness and stalling moments, but all in all, the movie never bores to the point where interest is lost. Any negatives are easily outdone by a tremendous climax of big W, T and F expression as one wonders how will Sister Irene, let alone the other two main characters, defeat the Nun as hell opens up and is about to release upon the world. One last note of interest, that Romanian setting sure does give a helpful shady serving of a Hammer Horror feel. 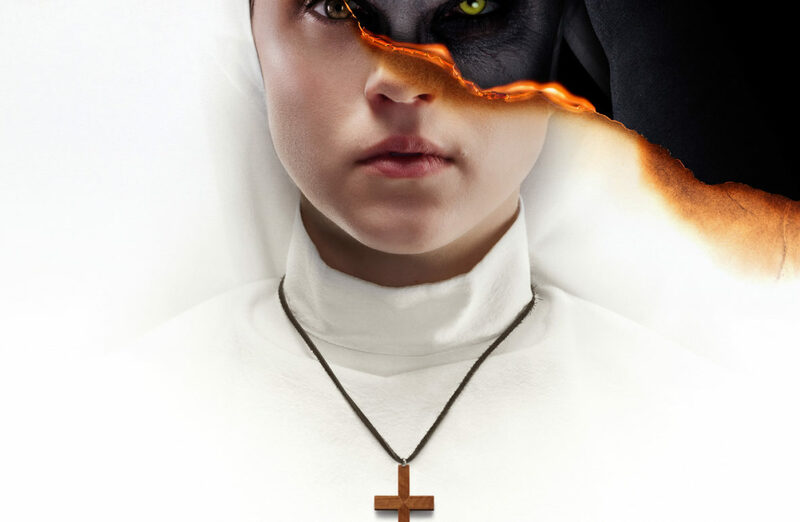 Whether others agree or disagree, after two weeks, The Nun has brought in just over $86 million at the box office, showing the studio that there still may be some sequels to conjure up in the writers’ room.